Point Line Flow: Information Streams. (News Streams as Lived Experience). Jonathan Richards at Resonate 2012. Information Streams. (News Streams as Lived Experience). Jonathan Richards at Resonate 2012. 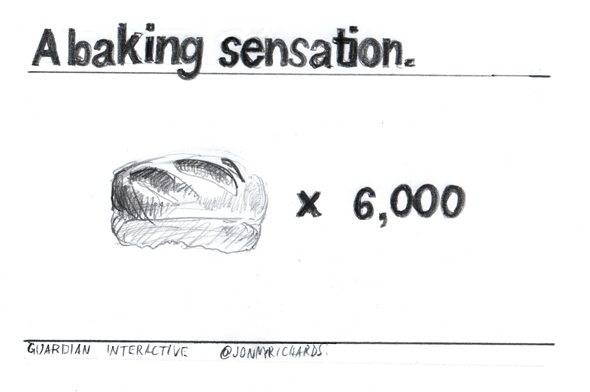 Drawing based on Jonathan Richard's presentation slide. Jonathan Richards of The Guardian Interactive department held a speech at the Resonate festival on March 15, 2012. He offered an extraordinary elaboration of information streams, the argument I have tackled recently, so I felt compelled to share his talk with you, (and to add a couple of comments to it). Jonathan introduced us to the concept of streams through a historical parallel with energy. In the 1st AD, Claudius, the emperor of Rome, has built the greatest power plant of the time. The city of Arles, in south-eastern France, is sited near the mountain chain of Alpilles. Romans cut into the slopes of nearby hills, where they installed 8 pairs of wheels which directed water from the river and acted as a mill. It was an enormous baking enterprise, producing daily 4,5 tons of flour and, thus, nourishing 6 thousand people. The news have adopted this paradigm quite recently, essentially in the last 5 years. “Before 2004 none of [news streams] existed, even the Facebook introduced its news feed in December 2006, now its key feature. So, it's been only 5 years. We all use them, we know how they work, any individual can create the stream, choose the input, turn the stream on, and then the information gushes in (..)”. In the news sector, Jonathan cites the examples of The Guardian's live blogs and Storify to explain the significance streams have gained. But, there is a sort of on-going dialectic or power struggle between the traditional front page layout of information (for example, The Times web site), and the streaming experience. Who will make the difference are maybe the smartphones, true bearers of streaming revolution. Their compact displays, in the same way Twitter did, radically transformed the monolithic front page by the introduction of “refresh” button, which really opens the door for many things. This new logic is essentialy based on this properties: a) streams come from multiple sources [and, eventually, merge into a single flow or a more scattered flow depending on the platform or software]; b) information in streams is distinguished, it comes in order, in sequence; c) streams are refreshable, they are frequently updated; d) streams do not end [they are potentially infinite]. Jonathan compares this state of things with “auto runner” games. They are derivatives of side-scrolling games, such as Super Mario Bros. Still, in older games, a player could stop and simply enjoy the landscape, whereas in newer iterations, there is no other option but to run, as “the world rushes on you”. 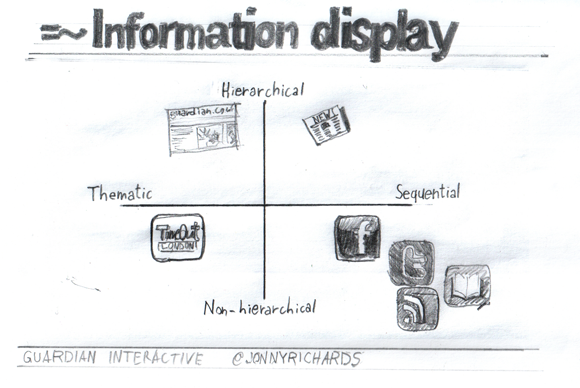 Jonathan classifies different kinds of information display in a very interesting diagram. On the other hand, newspapers “like to consider themselves as grand-daddies of hierarchical information”. News web sites, compared to their paper kins, are sequentially organised to lesser extent. They combine thematic and sequential organisation in still a more complex manner than newspapers. Aggregation of information is a try to make out some sense from news feeds. Bits of information are connected based on the occurrence and popularity of key words and / or visited links. For example, the recent Twitter acquisition, Summify, performs exactly that kind of task. But, aggregation is still essentially an automatic process [a quantitative one]. Instead, where journals can contribute majorly now, is contextualisation of information. It is becoming less important to to have the story and distribute it before the others. 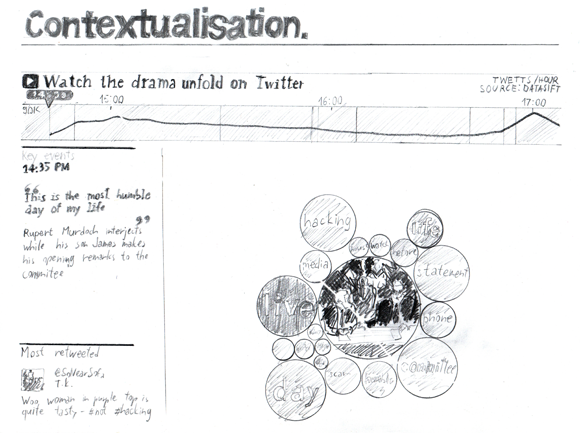 Increasingly, the focus is shifting on outlining the context of the whole picture. Finally, Jonathan provides two examples of contextualisation. He insists on the importance of “re-invoking the sequence”, graphic display of how information unfolds throughout time. The first example, still a prototype, attempts to sort out streams carrying different kinds of information in a parallel representation. In that way, a reader can see amounts of data, minute by minute, as iit appears in live blogs, pictures, social networks etc. The second example, here above, is the demonstration of the live follow-up which The Guardian provided for the Parliament hearing of Murdoch Senior and Junior. In the upper part of the screen is a scrollable timeline which shows also the amount of information concerning the event. In the left column, in the upper box is the journalistic coverage with quotes and key events. In the lower box is the most retweeted message concerning the event. The central space of the screen is occupied by a photo of the event, surrounded by bubbles displaying the most frequently tweeted words. This information display merges many different sources of information and their streams, journalist's blogs and social networks activity and thus permits to understand the event in a wider perspective. It does not only represent the event itself, but also the society within which it takes place, or, at least the internet part of the society. Jonathan concludes, “streams are one particular piece of the news cycle. No one, for a second, is going to say that the ability to extract news from the stream is going to be what the news are to become.” The ability to take event, to understand them, to guide people through a narrative, will still be pretty much the core of what Guardian is doing. To conclude, I will put forth two observations. I believe that one of the points is that journals should focus on story-telling. 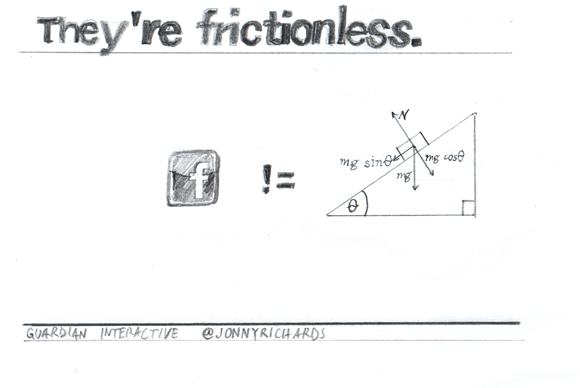 Hence the proximity of news feeds to books in Jonathan's diagram. What do books, at least fiction, try to represent? The live stream of events in which protagonists are immersed. That is also the aim of journalism. So, what is enthusiastic about the recent streaming nature of information is that it is coming closer to real life. Streams try to interprets the real life flow of events. I wrote “interpret”, as they are not about transmission, or reportage, of events. Their objective is to provide a “bigger picture”, a more complex idea of what is happening. The problem of context or frame is essential, as, in the course of events, as the causes and consequences change, we need to shift focus also. On one side, journalists are compelled to re-consider and refresh their opinions to match the course of the event. The same applies to readers which cannot comfortably read the newspaper, or even visit a news feed, and believe that they have grasped a social process entirely. This apparently incessant refreshing of information does not mean we are living in an incomprehensible tornado or kaleidoscope of news. Without doubt, streams are causing greater stress in the news industry, with its tighter deadlines, and they can cause more stress on behalf of the reader, as he tries to grasp the constant updates. But, maybe this is the price to be paid if we are to gain true knowledge on social processes around us. In that sense, news streams explicate the true phenomenological characteristic of social processes, the fact that they cannot be never fully dissected and explained, so we should try to forget the ready-to-use news. Only if we engage, or immerse ourselves in their stream, their transformative potential can be realised. News feeds, if organised textually and graphically in a determinate manner, can bring about a real epistemological transformation in how we live our everyday experience. Information streams move away from mechanical logic of understanding social processes, based on linear causes and effects, to systems logic. In systems, events are reciprocally correlated through chains of feedback loops, as they are in real life. Maybe news streams are already disseminating systems logic among us seamlessly? What social effects could this have? Jonathan, thank you for the most inspiring talk.